Creative has a pretty good track record with its mid-range in-ear earphones like the EP-630 and the more recent EP-830. 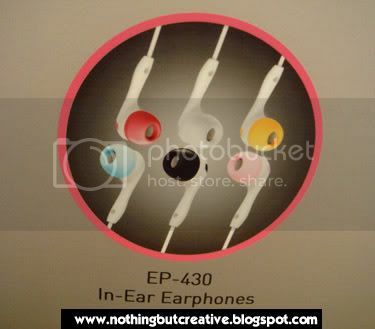 Today we have for you the yet-to-be released EP-430, Creative's latest in-ear earphones that is available in 6 different colors. Launched as a new accessory for the new ZEN Mozaic, the EP-430 looks pretty darn good and the colored ear buds gives you the freedom to choose a color that matches your player. No words on pricing yet but do stay tune as we bring you the latest news on Creative. UPDATE: The EP-430 retails at SGD$29(!) at the COMEX SHOW 2008.